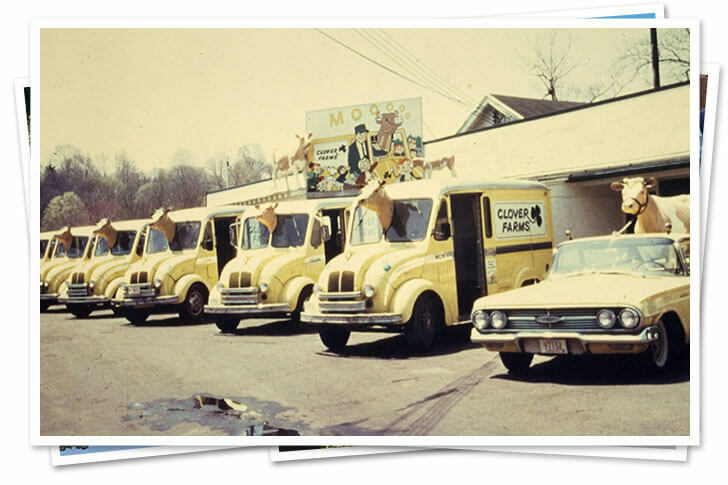 What do Stew Leonard’s, Woodstock, the 1969 Miracle Mets, and Sesame Street all have in common? 2019 marks the 50th Anniversary of each! Wow! 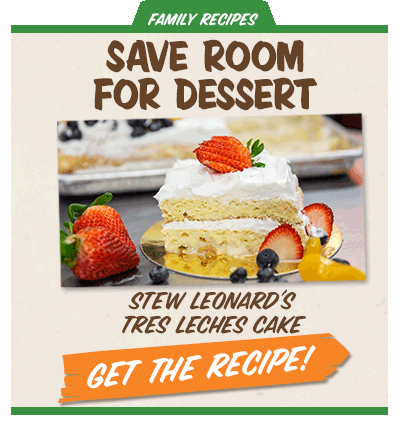 We invite you to celebrate Stew Leonard’s golden anniversary as we feature Fresh, Family and FUN in exciting ways throughout the year. We’ll kick off the celebration April 3, 2019 and end in November with another milestone: the 90th birthday of store founder Stew Leonard Sr.! 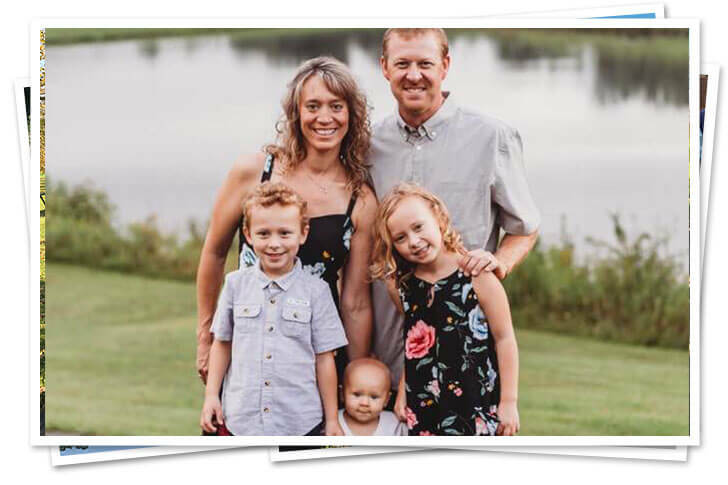 Visit this page each month as we feature new items, special events, contests, exclusive offers and fun stories featuring the Leonard’s family, spotlights on our Team Members who tireless work behind the scenes, fun facts and more! 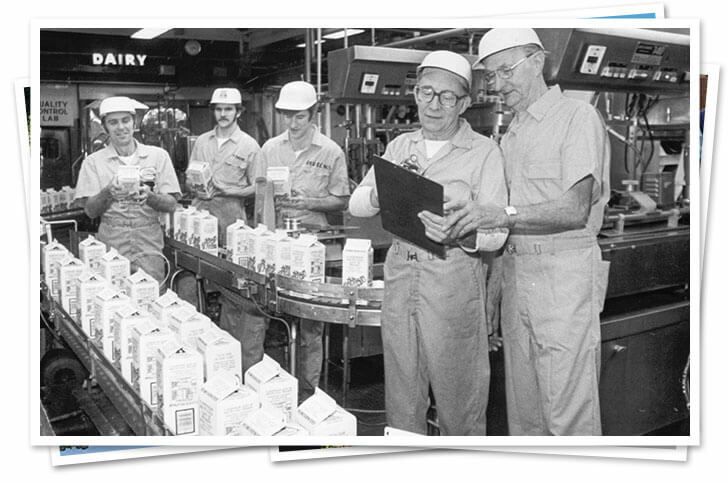 In the late sixties, Stew Leonard was delivering fresh milk from his Father’s Dairy in Norwalk, CT - a heritage his family carried on since 1921. 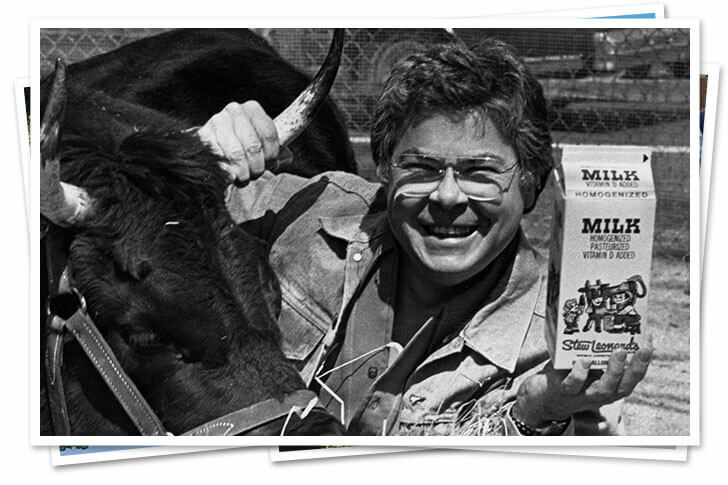 Stew loved to drive his dairy truck equipped with a cow head on top and a horn that would “Moo” as children waved, but he realized the milk delivery business was going the way of the horse and buggy. 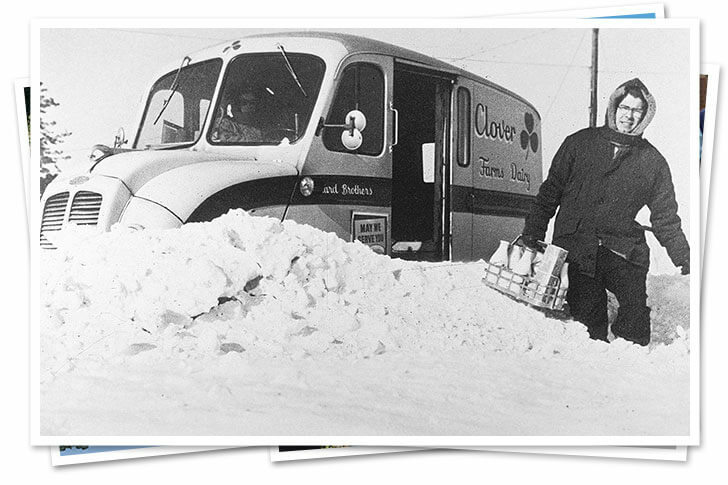 He knew it was time to start something new when the state informed him that Clover Farms Dairy was in the path of a new highway. 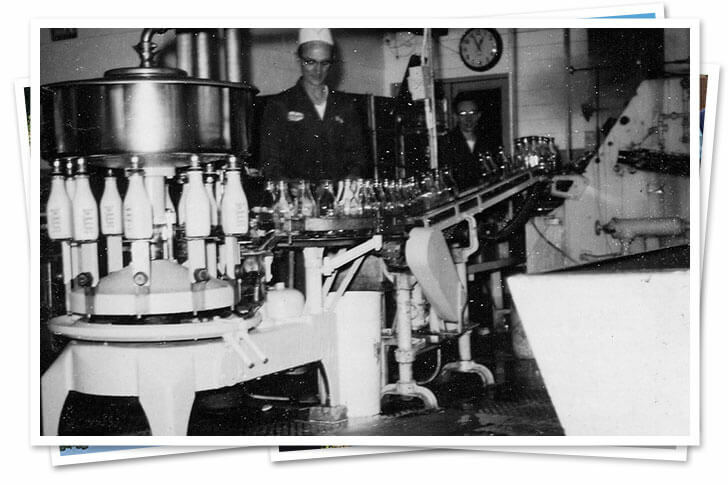 Stew Leonard's dream was to build a retail dairy store where children could watch milk being bottled while mothers did their shopping in a farmer's market atmosphere. 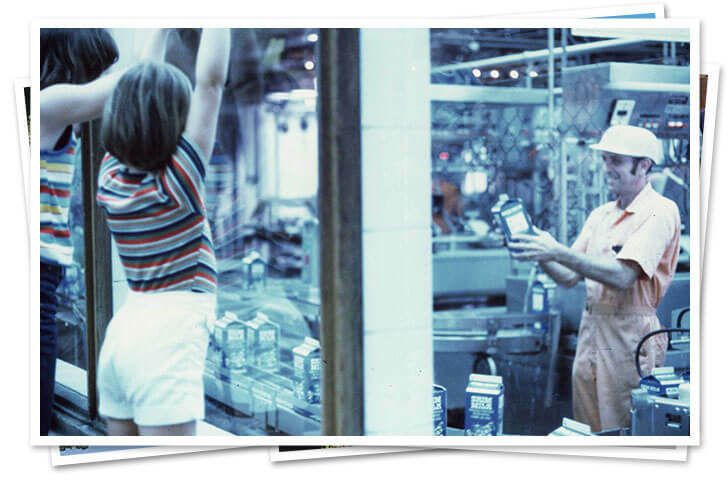 In December 1969, Stew Leonard's opened its doors - a 17,000 square foot store carrying just eight items. Still all in the family! 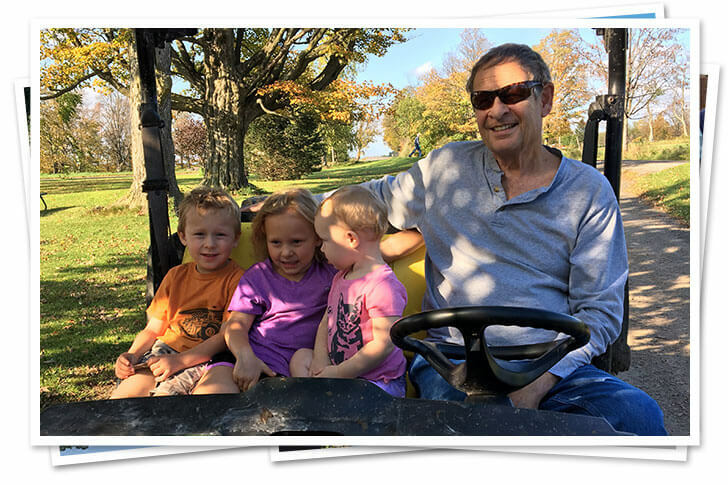 Stew Sr. and his wife Marianne have long since retired, but you’ll still find them handing out warm chocolate chip cookies or attending special events at the store in Norwalk, CT often. Stew Leonard's has remained a family business. 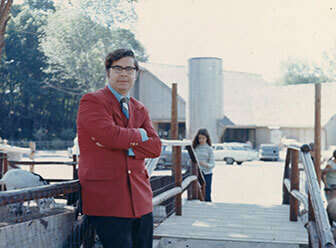 In 1987, Stew Leonard, Jr. - Stew's son - took over the reins and is now President and CEO. Stew Leonard’s daughter Beth founded the famous Bethy's Bakery and heads up the Gift Center. Daughter Jill is Vice President of Culture and Communication. Stew Leonard’s now has 6 food stores in CT, NY and will be opening a 7th location in Paramus, NJ with Stew’s nephew Jake as Store President. Did you ever wonder where our big Rule 1 and Rule 2 rock at the front door of our store came from? 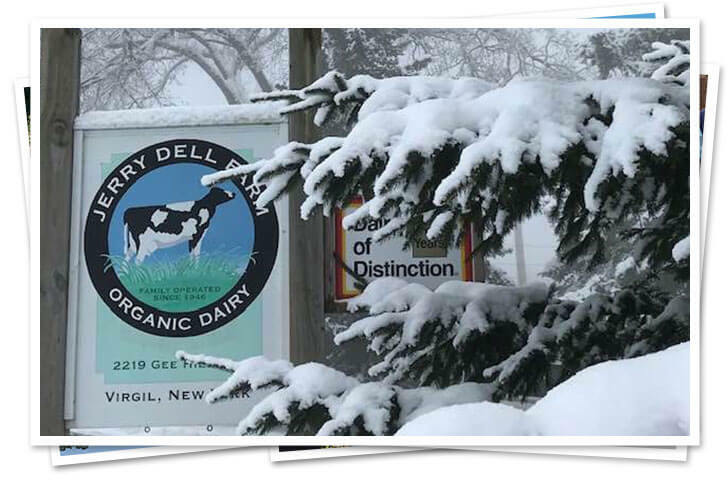 Well, a few days after I opened our little dairy on November 30, back in 1969, I was thrilled to be standing by the front door welcoming our customers. We had only seven Team Members at the time, and I had everything I owned in the world invested in our new little dairy store. Suddenly, a lady came up to me burning mad. (The veins were even popping out in her neck.) She had a half gallon of our wonderful Holiday Egg Nog in her hand. She thrust it at me and said, "This egg nog doesn't taste right!" I took a sip from the carton and said, "It's supposed to be spicy. It tastes fine to me!" Then I handed it to our store manager, Barry, who was standing next to me and he tasted it, too. Barry also said to the lady, "It tastes fine to me." With that, she screamed, "I want my money back!" I reached into my pocket and as I started to hand her a dollar bill (egg nog was 95 cents a half gallon in those days), she snatched the dollar out of my hand and didn't even give me my nickel change. Then she bolted out the door. That night I couldn't stop thinking about the egg nog customer. I had to agree that Marianne was right, and I was wrong! The next day on my way to work, I drove by Bates Monument Works on Riverside Avenue in Norwalk. They sell grave stones for cemeteries. They were unloading a huge rock of granite off their truck. That gave me an idea. I stopped and arranged for them to deliver the big 6-ton granite rock over to the front door of my store. Then, right there, in front of all our customers, I had them carve our new two rule motto that I had just been taught into the face of the stone. Rule 1. The customer is always right! Rule 2. 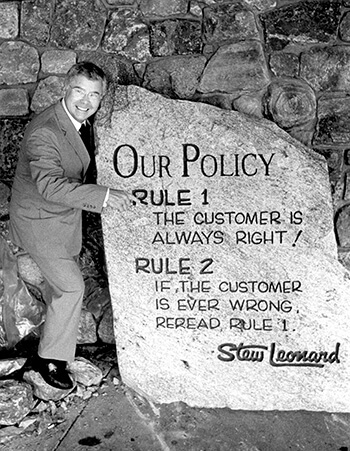 If the customer is ever wrong, Reread Rule 1. Just like Stew Leonard’s, Vaughn and Susan Sherman have something special to celebrate this year: 50 years of marriage! 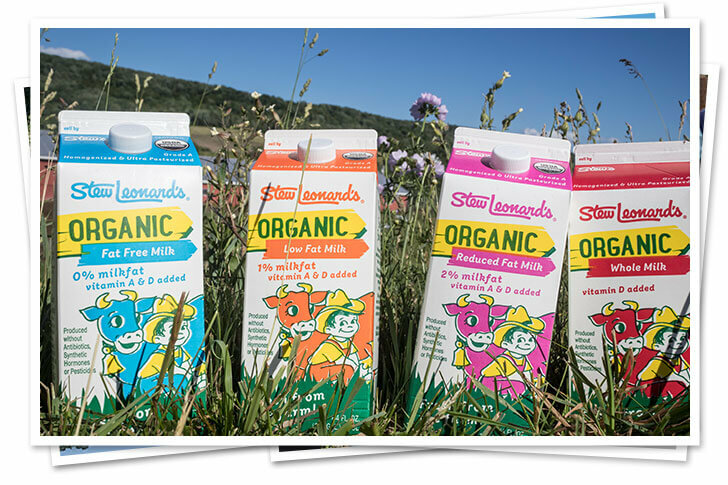 They’re dairy farmers in upstate New York and have been supplying Stew Leonard’s with organic milk since 2010. 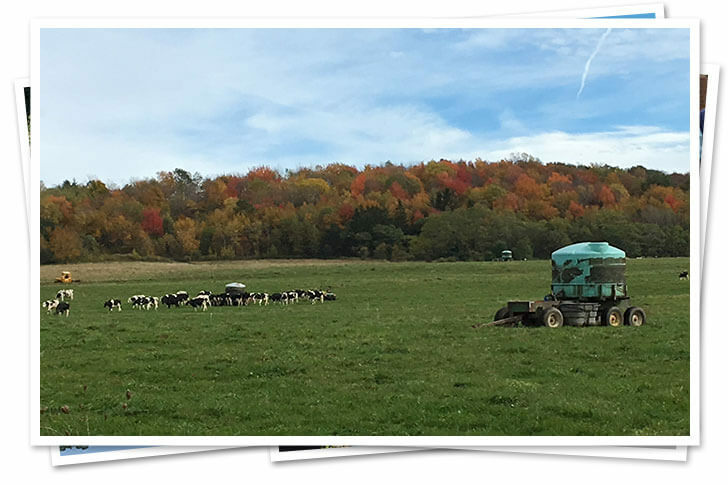 It’s a family affair on the Sherman farm, with son Ryan overseeing crop rotation and what they feed their more than 300 dairy cows spread across 500 acres. 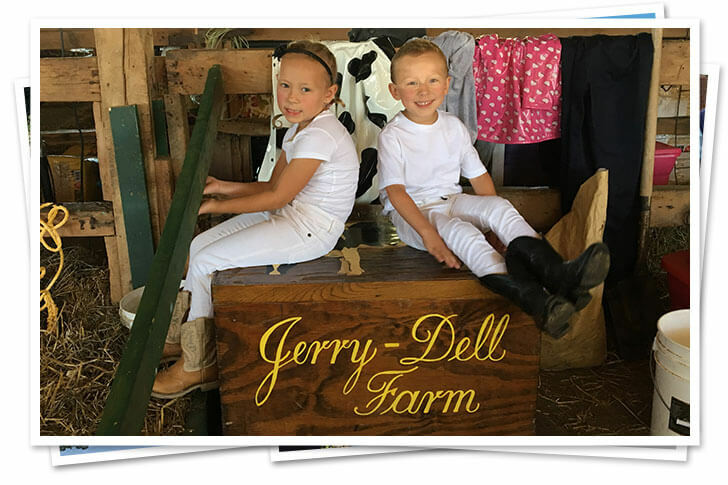 Vaughn and Susan’s eight grandchildren all live within a mile of the farm, so they visit regularly to feed the calves and take care of the chickens. 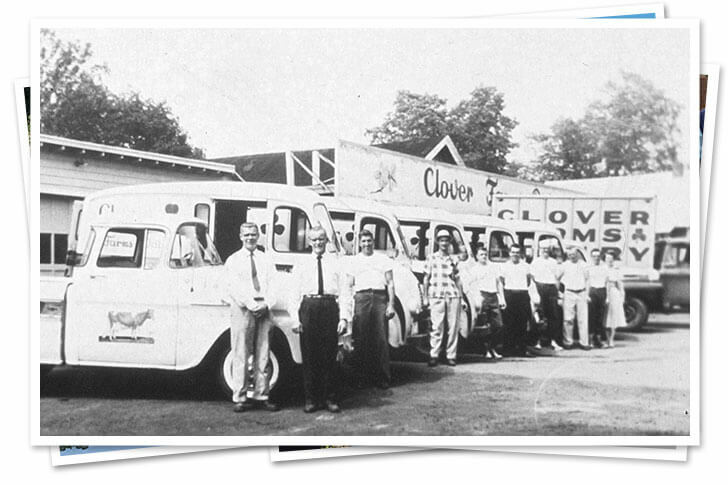 In 1967, Stew Sr. was told that the State of Connecticut planned on building the new Route 7 highway through the center of the Clover Farms Dairy. They would be forced to relocate. He set his sights on an old farm on U.S. Route 1. It was owned by a woman named Hazel Schultze, who had turned her large, pink house into a bed-and-breakfast and her side yard was several acres of meadow, dotted with grazing sheep. 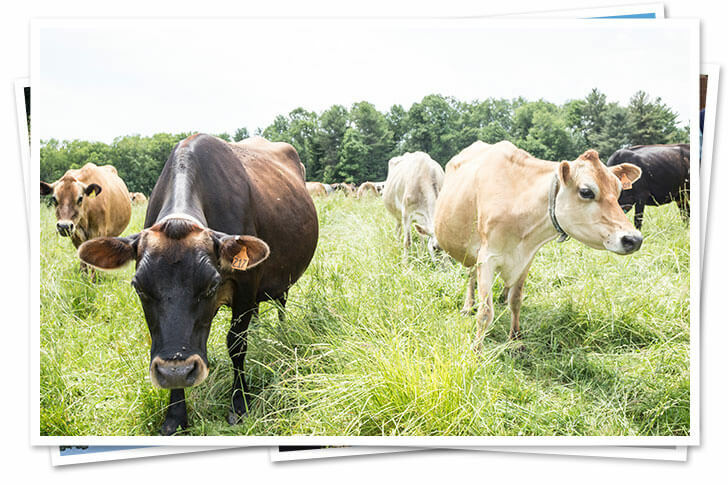 Stew wanted to buy 1 ½ acres of her farm to build his new dairy, but Hazel Schultze didn’t want to sell. She wanted the pasture for her sheep. Stew visited her over the next few weeks and came up with the idea that if Mrs. Schultze sold him the land, he would build a farm for her sheep. He would even add some goats, ducks, and chickens to make it a “real” farm, and she could visit with her sheep every day. He even agreed to hire her friend, George, who had been taking care of the animals for her. Mrs. Schultze agreed, and Stew could see his dream coming true. This was how “Stew’s Little Farm” began and it has grown steadily ever since. 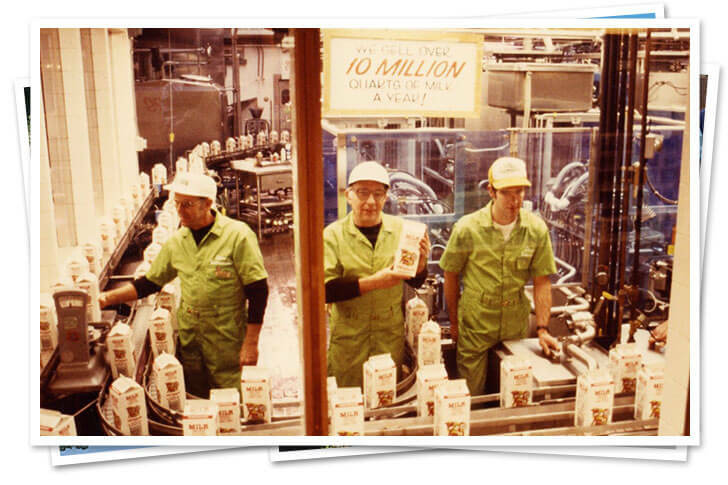 When the Danbury store was built, a farm was part of the original plans and then Yonkers, NY followed suit in 1999. 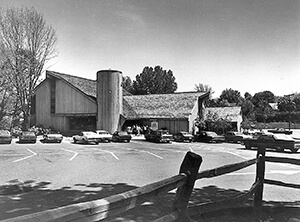 Since the original store opened in 1969 there has always been a “Stew’s Little Farm” where families could come, enjoy the outdoors, have some ice cream and pet the animals. 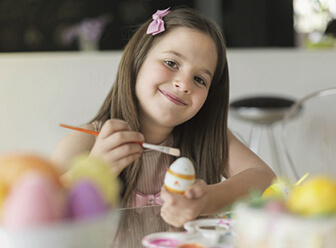 Hop on over to our Events Calendar to find out about our Easter Eggstravaganzas, Egg Painting Classes, Little Farm Opening Day Celebrations, Cooking Classes and More!